Mosaic trivets are a good beginner project. You can buy mosaic trivet kits or make your own with left over tiles or you can even use cracked or chipped china. I prefer designing and making mosaic coasters from scratch, using material or tesserae I have lying around from old mosaic projects. Any left over ceramic, porcelain, marble, granite or glass tiles are perfect. A mosaic plaque will protect kitchen counter tops and dinning tables from hot dishes and they are a great alternative to those traditional iron trivets. So gather your mosaic materials and start making your own mosaic trivet. To help you start here is a list of the things you will need and easy instructions to follow. A mosaic base, this can be an old piece of plywood or you can purchase a base. Mosaic materials or tesserae which can be anything from old broken china plates to left over ceramic or glass tiles. To glue your mosaic tiles you will need a good adhesive such as Weldbond Glue or liquid nails. You will also need grout and tile sealer. A tile sponge, a bucket and some rubber gloves. To make your mosaic trivets prepare your pieces. To break your tiles into smaller pieces it is safer to insert your tile between sheets of newspaper or old cloth and then hit it with the hammer. Remember to always work safely and wear your safety glasses here. Even sandwiched between paper or cloth small pieces can fly up to your face. Before doing the next step you can dry run your design! Place all your pieces onto your base to see how it looks then once you are satisfied then proceed. You can just place your pieces arbitrarily or use a pattern. The next step consists of gluing your pieces to your base. You can either spread a tile adhesive directly on your mosaic trivet base or you can apply a tube glue, such as liquid nails, directly on the back of each piece. Whatever method you use, keep your tiles about 1/8 to 1/4 inches apart. After the tiles have set for at least 24 hours you can grout mosaic trivet. Mix your grout according to the instructions on the package. To apply the grout on a small surface like a mosaic trivet you can use your hands to push the grout into the grout lines rather than using a grout float. Rub your hands all over making sure you entirely fill all grout lines. Always wear a good pair of rubber gloves for this step. 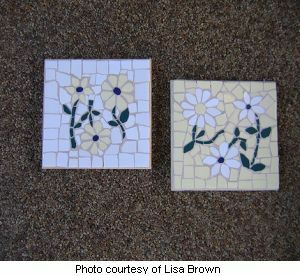 Now to preserve your new mosaic coaster it is recommended to seal your grout lines. I let my grout dry completely for about 5 to 7 days before applying the sealer. Now all you need to do is add self-adhesive felt pads under the mosaic trivet to prevent any possible damage to your counter tops or table.